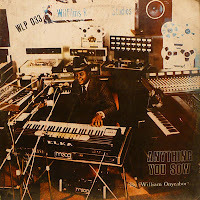 Over the weekend I was introduced to William Onyeabor's addictive blend of Nigerian electronic funk music and now I really HAVE to hear every single song he's ever written. Amazing stuff! His music comprises of heavy afro beats and crazy soulful synth sounds from the heady days of a 70's Nigerian funk scene that until Saturday, I never knew existed. Some of the electronic sounds leave you doubting his songs were recorded in the late 70's/early 80's, but they really were and pretty much no one anywhere else in the world was making music like this back then. From a quick glance around the internet I can see his music has a similar positive effect on a lot of people and finding copies of his recordings is akin to rare stamp collecting- albums sell for hundreds of dollars on ebay. Maybe it's time for a re-release? "William Onyeabor studied cinematography in Russia for many years, returning to Nigeria in the mid-70s to start his own Wilfilms music label and to set up a music and film production studio. He recorded a number of hit songs in Nigeria during the 70s, the biggest of which was “Atomic Bomb” in 1978. William has now been crowned a High Chief in Enugu, where he lives today as a successful businessman working on government contracts and running his own flour mill." I recommend you listen to these videos and soak up the moralistic teachings of a young William Onyeabor, a guy whose music was so far ahead of itself, we're only just catching up!